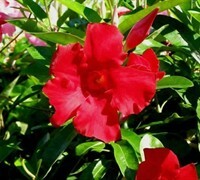 Below are common attributes associated to Giant Crimson Mandevilla. Become a care taker for Giant Crimson Mandevilla! Below are member comments regarding how to plant Giant Crimson Mandevilla. No comments have been posted regarding how to plant Giant Crimson Mandevilla. Be the first! Do you know how to plant Giant Crimson Mandevilla? Below are member comments regarding how to prune Giant Crimson Mandevilla. No comments have been posted regarding how to prune Giant Crimson Mandevilla. Be the first! Do you know how to prune Giant Crimson Mandevilla? Below are member comments regarding how to fertilize Giant Crimson Mandevilla. No comments have been posted regarding how to fertilize Giant Crimson Mandevilla. Be the first! Do you know how to fertlize and water Giant Crimson Mandevilla? Below are member comments regarding how to deal with Giant Crimson Mandevilla's pests and problems. No comments have been posted regarding how to deal with Giant Crimson Mandevilla's pests and problems. Be the first! Do you know how to deal with pests and problems with Giant Crimson Mandevilla? Looking for Giant Crimson Mandevilla? Crimson Giant produces the largest flowers of any of the Sun Parasol series of mandevilla. I measured the one's on my vine at 5 inches across! In all but zones 10 and further south, Giant Crimson Mandevilla is a seasonal flowering vine that will not survive winters outdoors. But the profusion of giant red flowers produced make this fast growing flowering tropical vine a worthwhile annual to use in colder regions to climb trellises, arches, fences or other forms of support. When planted in a container the plant can be cut back some and brought indoors during the winter. When planting in the ground, choose a sunny location with well-drained soil. If your soil is heavy clay add some sand, gravel, sandy topsoil and/or soil conditioner at a 50/50 ratio with the soil moved from the planting hole. Mandevilla does not require pruning however you can snip of vines that grow out of bounds. Use some type of support for this vine to climb on, such as a trellis. I fertilize Mandevilla with a slow-release all-purpose flower fertilizer at planting time and again in mid-summer if necessary. Here in Georgia, where I grow Mandevilla seasonally, I haven't seen any serious insect or disease problems.